A great dish for heart health and weight management and a good source of protein for strong muscles. This is my attempt to recreate a dish I had once in Greece and loved. The preserved lemons really add a zing and the spicy coriander mix is great with the nuts. My taste testers thought it was really tasty. Blitz the nuts and preserved lemon in a food processor. Add the coriander leaves (leaving a few for garnish) and give them a quick pulse – you don’t want to pulverise them just break them up a bit. Add the harissa paste. Spoon the nut, lemon and spice mixture onto each fish fillet and wrap up in the foil. If you have time you can marinade the fish in fridge for a couple of hours. If not then just pop them straight in the oven. Cook for about 15 minutes then check to se if the flesh is cooked through. Spritz with a bit of fresh lemon juice and garnish with coriander leaves. 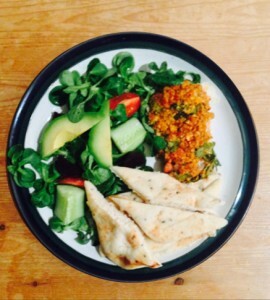 Serve with salad and warmed pitta bread or naan.